Welcoming WWII and Korean War Veterans home at Midway airport after their visit to Washington, D.C. through Honor Flight Chicago. 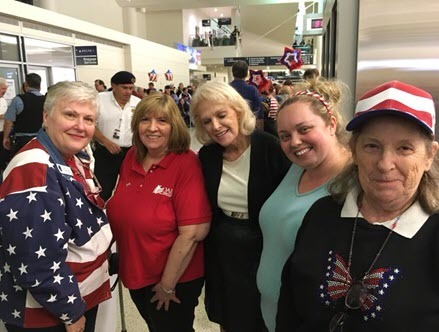 Chicago Chapter participates in Honor Flight Chicago events. This is a special organization that honors WWII Veterans by sending them to the WWII Memorial in Washington, D.C. for free. Chicago Chapter joins thousands of others to welcome these veterans home with thank yous, hugs, and kisses.